Got Xainfried with free 5* ticket, my first water 5*... ok I guess? No he's awful delete the game. I have 6 out of the 13 5-stars, so I have an almost 50% chance of getting a dupe. I'll probably wait until they add more to the pool before I use my ticket. Back up to 15k wyrmite! Maribelle is the only 5* I really wanted and I got her with the free ticket. Good Lord water needs a healer. I am currently using my light healer to help out my water team. BTW, my 5* Ticket once again keeps giving me Xainfried (nothing like 3000 mana point huh...), good news my Wyrmite didn't let me down. Got Annelie!! Finally another 5* Light to help with the team!!! So Water is freaking loaded with Attackers and Supporters. Christmas Cleo is Ridiculous Tier 1, Lily is Tier 1, so is Xander. XainFried is Tier 2, Never mind the lvl 4 water characters are Tier 2's...SOO OP. LOL at Hildegarde is the default L5 Healer for all teams. They need to make one of the hero's in the next few events to be healers. You don't need to have DPS and Support on every Event as the main character. Mix it up! Now I'm wondering if I should keep Naveed on my team. I used ticket, dupe Ezelith. I don't even have much of the pool but it's whatever. Life goes on. Yes!!! After 12 games, I finally found a group to help me beat High Midgar!!!! Took a Maxed out Mikoto, 5500 Venessa and a 4900 Verica to beat him. It was intense!!! Thanks to the guy who provided the video guide, helped me beat the boss!!! I dodged the eldwater at least and scored Naveed. Not that I needed another fire character. Jeez I have every fire 5 star except Sarisse. Other than light my teams are struggle city. Got Lucretia from my 5* ticket, which was certainly nice. She is my first light 5*, and with that I now have at least one 5* character for every element. Now I just need to get enough luck to match that with dragons. 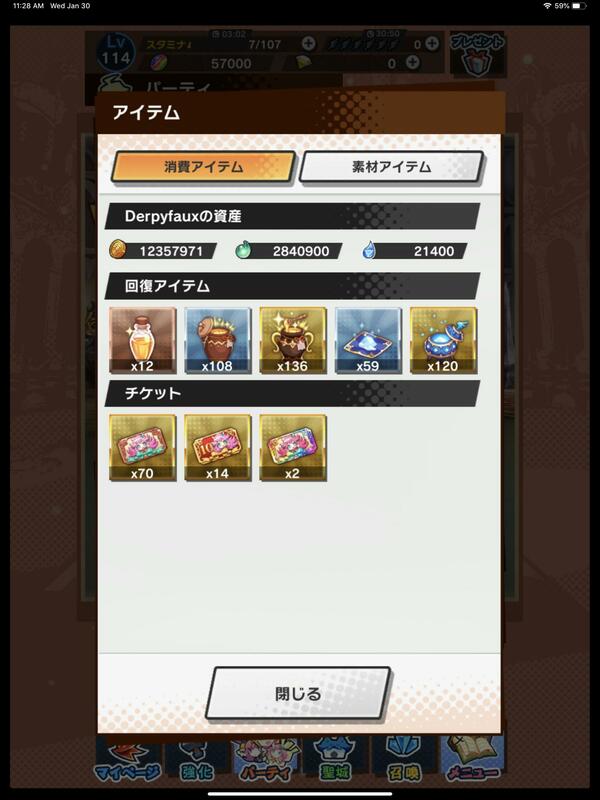 57000 Wyrmite, 70 single-summon tickets, 14 tenfolds, and 2 5* summon vouchers, for 690 pulls with at least one guaranteed 5* adventurer. 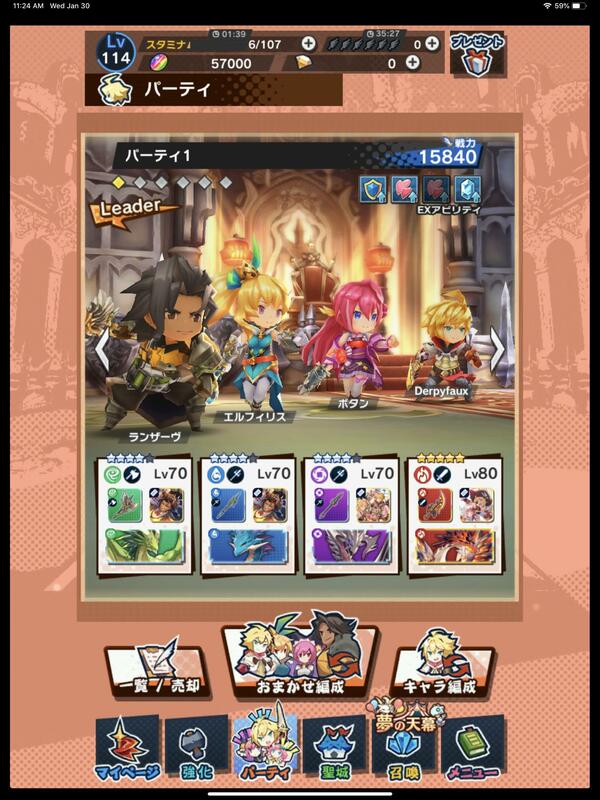 And here’s the team I plan to use for the upcoming raid, replacing Euden with the welfare character. Rolled the dice on the 5* ticket and got Lucretia. I don't really need her, but I'm just happy to dodge the eldwater bullet. Yep. Of course, I've only gotten two dupes (Dupe Sarisse and Dupe Ezelith), so....again, can't really complain since I got up to eight 5* adventurers before getting a couple of dupes. For this next event, I'll probably just do what I did with this one and just do daily summons in order to save up for the Valentine's banner. So here is our Wind sword, straight from Shiren the Wanderer. It makes me want to pull. I need that Shiren....or the Panda Dragon. Hope i get either of them within amulti. I guess I should post the 3 star as well. I have a decent enough team for the event (Musashi, Lowen, Hawk, and either Aileen or Event Dagger Dude), and enough dragons, so I am going to sit on my wyrmite and tickets until the next Gala. The sword guy looks really cool though, and the dragon effect sounds pretty decent... Gotta hold strong! I really hope the wind sword and the light wand drops for me during daily pulls. Saving as much wrymite as possible for Valentine’s Day or the next Dark Element banner. quick question, is a 5* T3 0UB (on an on-element character) stronger than a MUB 5* T2? Just wondering if I should bother enhancing if I dont have the means to unbind it at all yet. Really digging all the wind units, oh boy there goes my savings. So yeah, I need anything other than Water. This will be a wind event and I've got Hawk already. 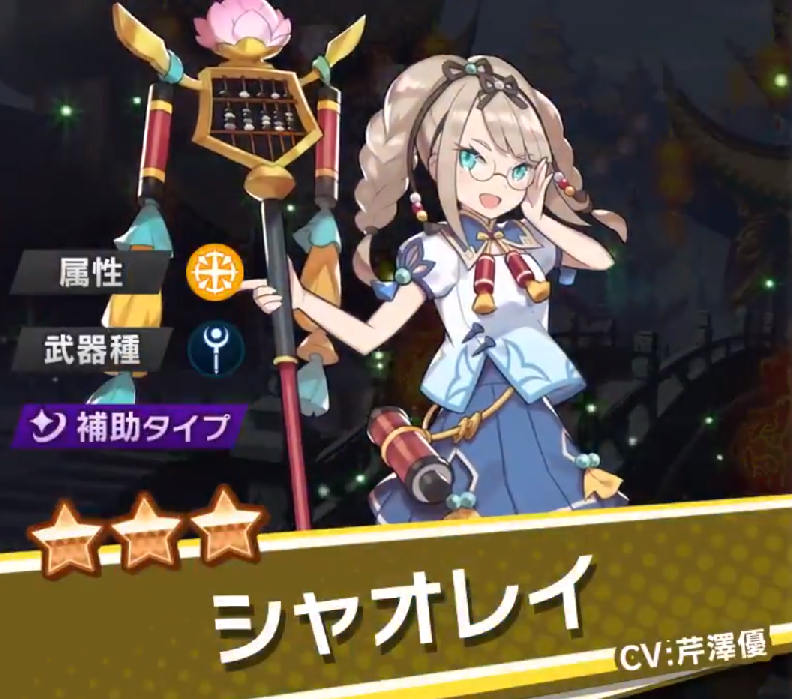 But I'm worried I'd probably end up pulling Louise rather than the new characters (who's also a bow). Not sure If I'll just sit this one out. Way stronger. 5t3 0UB gives some 350ish more strength to an on-element character compared to the 5t2 MUB. So my question is...when I buy the base Glorious Tempest/Volcanic Queen card, can I ensure I use the low level card instead of spending the unbided ones? I allow myself a 10-pull on this banner but no more. Gotta save for valentines day. Yes. When buying Glorious Tempest/Volcanic Queen you have to tap on the Greatwyrm card and choose which one you want to use. Pity rates transfer to new banners right? Dunno why I thought they did. I’m resisting temptation and opting to wait till my dailies rate up (or get a 5*, I guess, since that’s somehow happened twice in the past week) before I pull; I’m probably only doing ticket + 10 wyrmite anyway. I don’t actually want to be quite so stocked up on wyrmite to the degree I’ll be as a result, but this banner isn’t very appealing... hopefully the next one is, I guess. Did my pull. Literally nothing of note besides a new 4* wyrmprint. Ugh. Did some pulls on the new banner since Wind is still the only element I don't have a natural 5* in and for some reason I got light lance girl 5* from the old banner. :I Didn't pull on that banner for a reason, I already had H!E. Just did 2 10-pulls, got the new 4 and 3 star people, and I finally got Verica!